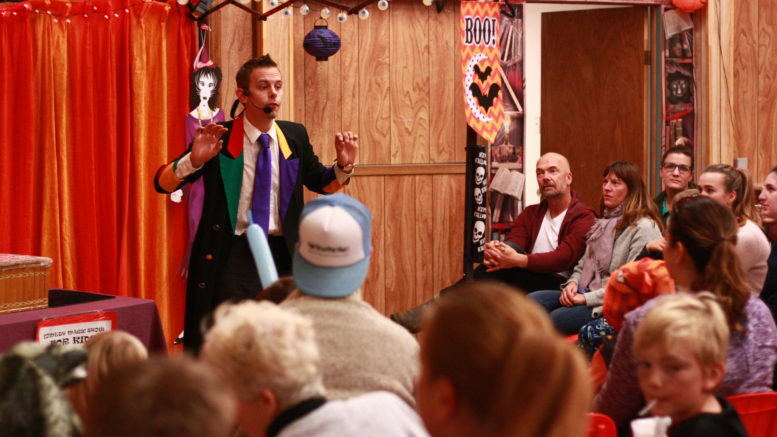 Performer Randy the Magicman captivates the audience during Consecon's Haunting in the Hamlet. It was another year of spooky fun in Consecon. The fourth annual Haunting in the Hamlet brought an entire day of Halloween hijinks to Consecon. The Ameliasburgh recreation committee-supported event kicked off Saturday morning with a pancake breakfast at the Consecon Legion and events ran well into the evening hours. The Haunting’s principal organizer, Toby Toth, said the event started out slow, but finished strong with an impressive number of children and families taking part in events across the village. It seemed the entirety of Consecon got behind the event. Crafts and games took place at the Masonic Hall, pancake breakfast and escape rooms at the Legion, painting and other events at businesses around town and it all culminated in community barbecue and a youth dance. Toth said there were lots of reasons organizers wanted to ensure the event was truly community wide. She said the more residents work together to build a memorable event, the more the community benefits in the long run. One event that captured the imagination of children and parents alike was the magic show, featuring performer Randy the Magicman. Toth said organizers always like to have one big draw for the kids. The magician was such a hit last year, they decided to bring him back again, she said. Throughout the show, kids were called up to the front of the crowd to participate in the comedic magic show. Toth said that kind of participation really makes a difference. Toth said it was almost as entertaining to see parents’ reactions to the show as it was to see the faces of the children. Along with returning favourites, the Haunting also featured some new experiences. The Mill PEC ran a haunted house and the Merchant’s Mill offered a chance to paint with artist Sarah Winn. Additionally, a series of escape room-type scenarios were run at the Consecon Legion. Overall, Toth said it was another great year for Haunting in the Hamlet. “It was definitely worth the work,” she said. Toth said the event is always looking for volunteers to help run events and make memorable experiences for the kids. Those interested are asked to contact hauntinginthehamlet@gmail.com for more information.